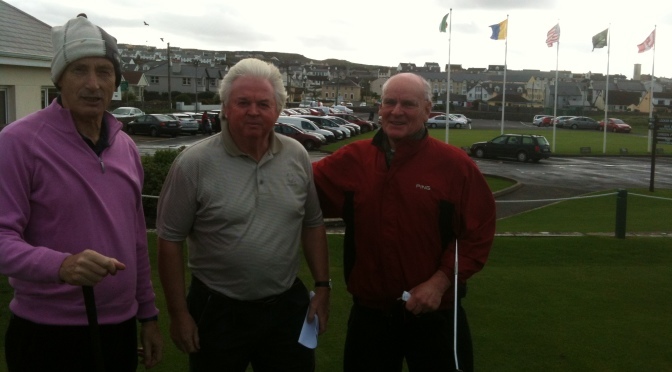 Here are the results of the Glenstal Old Boys Golf that took place at Lahinch Golf Club on Wednesday 9th October. The event was a great success and we will run it again next year but will try to get a Friday or Saturday date. We had 6 fourballs in all and the first tee time got under way at 12.20. and were out in 10 minutes intervals from there on. The weather was cold and windy but the held up for a day of wind and sunshine. We had 22 people playing golf and one dinner guest. Fr. Simon represented Glenstal Abbey and by the way did not win the Longest Drive despite being favourite to do so. Players were playing for the Fergus O’Toole Memorial Trophy, which was a lovely claret jug and this was presented to us by Fr. Simon and the Glenstal Community. We presented the prizes before sitting down to a 3 course meal and wine which had been prepared by the Club. We felt this was a better option as people were anxious to get on the road some having travelled long distances. Nearest the pin – David McMahon Jnr. Many thanks to Billy Gabbett and Paul O’Brien who helped with the organisation event and Fr. Simon who sponsored the Trophy as well as all those who travelled and participated in the event. The winner Eddie O’Toole had to rush away as he was off to England that night hence no pic!